I mean, there are carbs and cheese and grilled veggies! Nothing about it not to love if you ask me. Well, it’s simple. Just like the title states. Simple is good this time of year. It’s that time of year when schools are finishing up, the weather is turning nice and everyone has one thing on their minds, letting go and enjoying life. Of course, this was much easier to do when I was back in school, but I still have that same feeling I did when I was in middle school and we were in the last two weeks of school. Basically, I was just DYING for it to be over. Counting the days down, itching for that last day when you wore your prettiest summer outfit and things were just good. Obviously, things are not coming to a giant halt over here simply because June is approaching, but like I said, those feelings are still there. And to be honest, I hope I never get too old where I lose them. Because even though there aren’t going to be any drastic changes taking place around here, it’s still awesome to have those feelings surface . Anyway, pasta salads are perfect for these late spring days. Things are busy and I personally just want fresh, but still comforting, food. 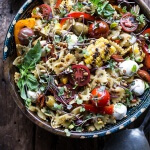 This pasta salad fits the bill. I know pasta salads are typically served cold, but I love mine warm, where the hot pasta starts to melt all the cheese. It’s my favorite. 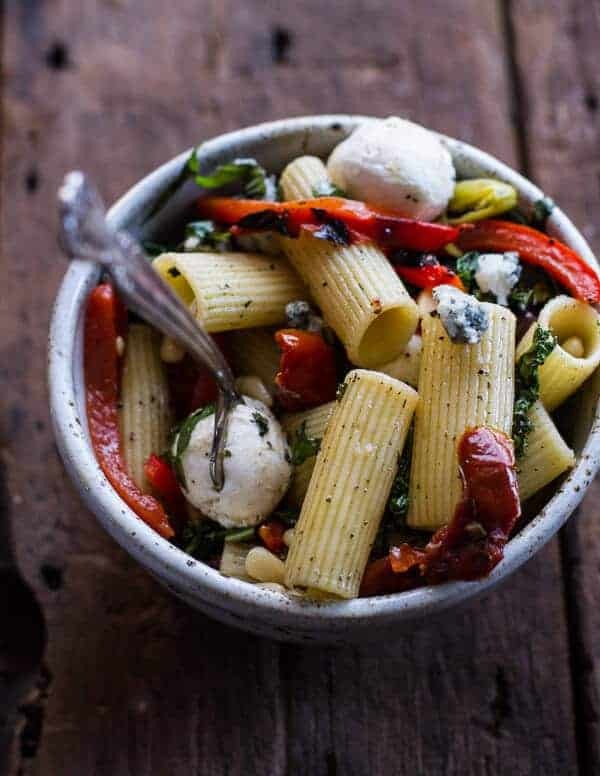 Grilled Kale and Veggie Tuscan Pasta Salad with Mozzarella + Blue Cheese. Rub the bell peppers with 1/2 tablespoon olive oil. Add the kale (stems on) to a large gallon size ziplock bag and add 1 1/2 tablespoons olive oil, salt and pepper. Seal the bag and massage the olive oil onto the kale for 1 minute, making sure all of the oil coats the kale. Wrap the garlic cloves in a small piece of tine foil. Place the bell peppers and garlic cloves on the grill and grill for 10 minutes, turning the peppers 2-3 times during cooking or until charred. Remove the peppers to a plate and add the kale to the grill. Grill the kale for 30 seconds to 1 minute on one side, then flip and grill another 30 seconds to 1 minute or until just beginning to char on the edges. Remove the kale leaves and the garlic from the grill. Allow the veggies to cool slightly and then slice the bell pepper, chop the kale and mince the garlic into a paste. Set aside. Add the balsamic vinegar and honey to a small saucepan and bring to a boil. Reduce to a very low simmer and cook for 10-15 minutes, until liquid reduces by about half and is slightly syrupy. Remove the balsamic from the heat add the remaining 1/2 cup olive oil, lemon juice, mashed garlic paste and a pinch of crushed red pepper. Whisk to combine and set aside. Bring a large pot of water to a boil. Boil the pasta according to package directions. 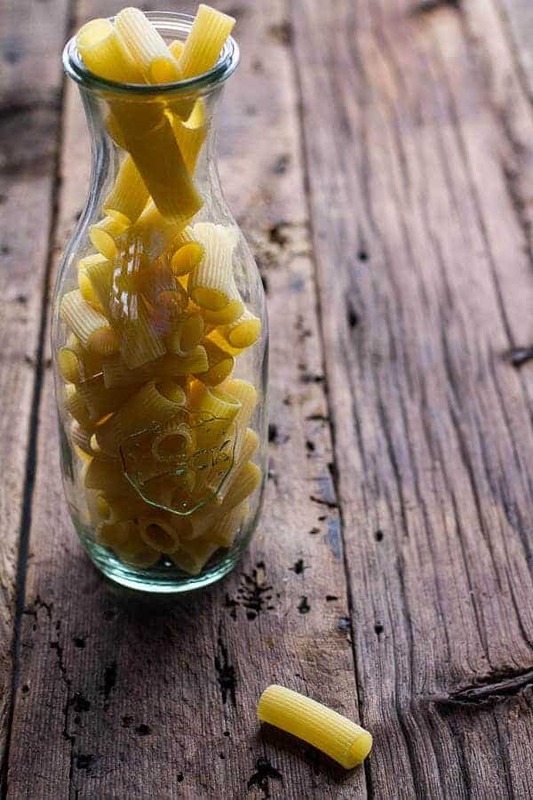 Drain the pasta and add to a large serving bowl. 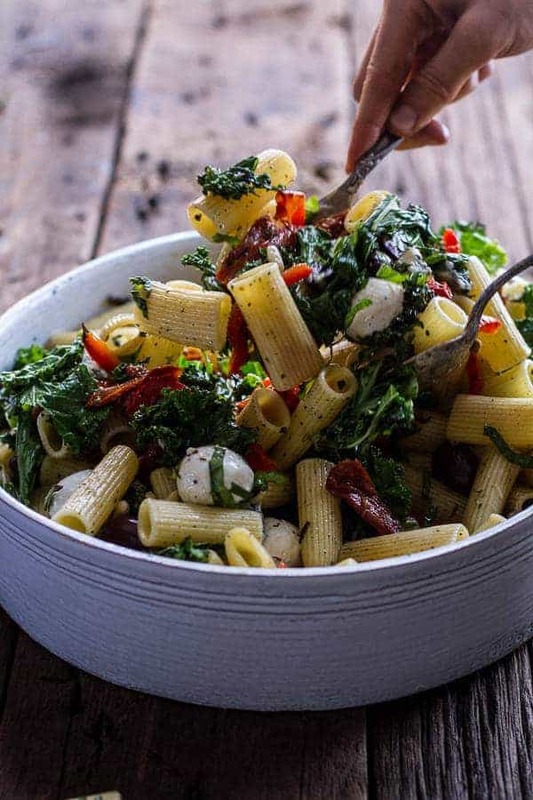 To the bowl add the sliced peppers, chopped kale, basil, oregano, pepperchinis, sun-dried tomatoes, kalamata olives, pine nuts and mozzarella. Add half the dressing and toss well. Taste and add the remaining dressing if desired. Sprinkle with blue cheese and serve warm or at room temperature. And since this is a salad, it is perfectly acceptable to eat bowl after bowl. Yes! This looks so good! Especially the grilled vegetables, yum! Wow Tieghan, that looks absolutely delicious. I wish that was what was in my packed lunch box today! Great inspiration, now if only I could readily source kale in Paris, then everything would be perfect! Since it has kale can i consider this super healthy! There is so much goodness jam-packed in this salad! Holy heck! 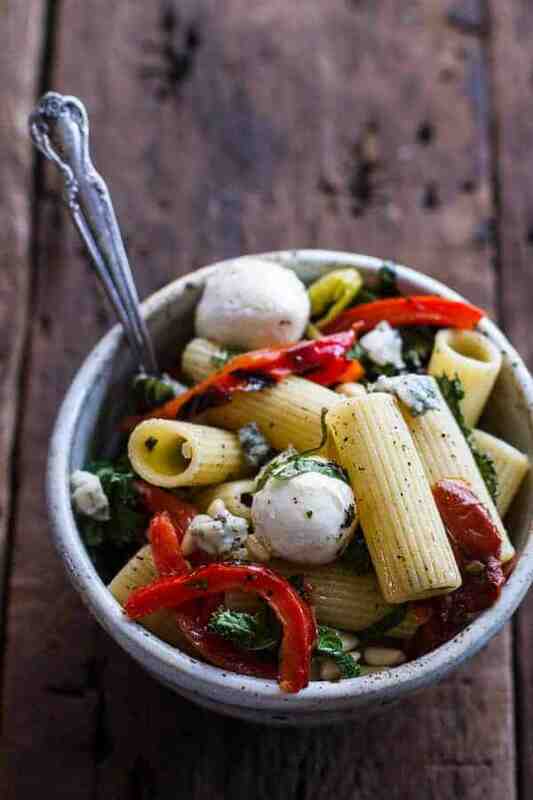 I LOVE fresh mozza…and grilled veggies…and carbs…and everything in that bowl of yum! Looks perfect as always Tieghan! Pinned! Thanks Taylor!! Hope you have a great memorial Day! 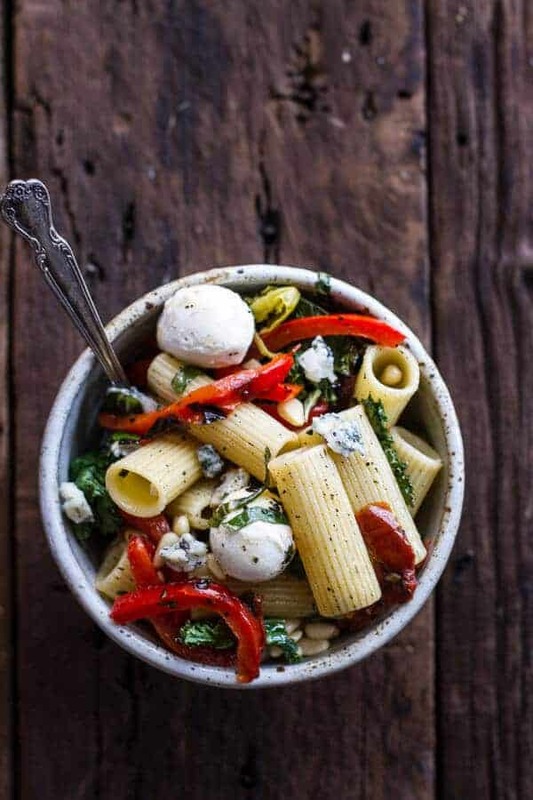 Pasta salads are a go to during the warmer months at our house and leftovers always make everyone at work jealous at lunch time. I love that the veggies are grilled and anything with olives is a favorite. Thanks Laura! Hope you are having a great Memorial day weekend! 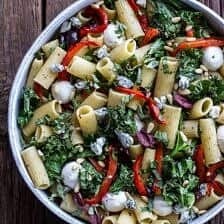 I always find that pasta salads make a great lunch during the summer and this looks like it would be absolutely perfect. Delicious! Me too!! Thanks Katheryn! Hope you are having a great weekend! Mozzarella and blue cheese?! Be still my heart. 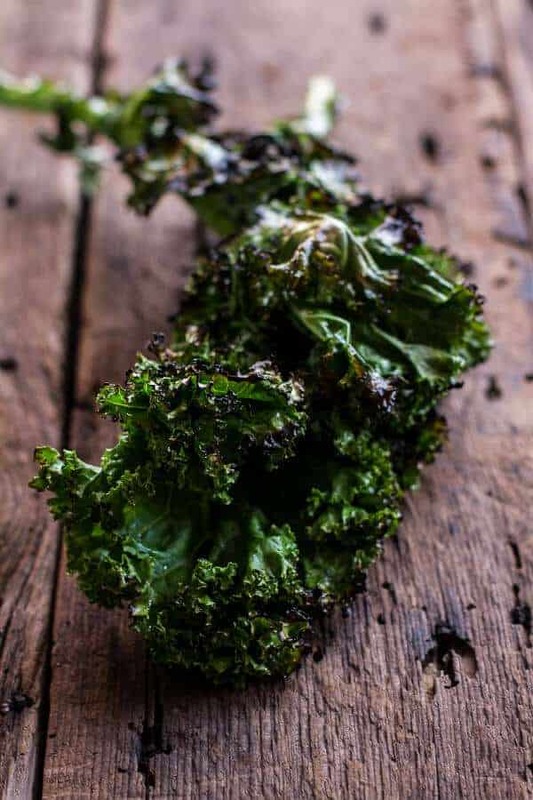 I would have never thought about grilling kale, but now I’m tempted to get some kale just to try it! 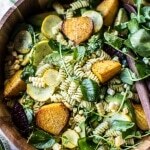 Gorgeous salad – those mozz balls are calling my name! Thanks!! Hope you are having a great time in Florida! Wow, this look great and I love the addition of kale! This could be dinner tonight! Definitely my kind of salad too. Especially with the roasted peppers, kale, and baby mozzarella balls. Thanks so much, Amanda!! 🙂 Hope you are having a great memorial day weekend! This looks absolutely delicious, my gosh. This looks amazing! I love pasta salads of all kinds! Everything you do looks and sounds amazing. 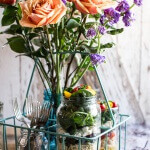 You are my goto site for yummy original recipes! Oh yes, I’d absolutely eat my weight in this salad! This looks so great! I’ve never really liked pasta salads because I don’t like that they’re cold either. So this one served warms sounds absolutely perfect! Yes please! This kind of simple yet flavor-packed salad is exactly what I want for lunch today. 🙂 I love all the bold ingredients! simple and delicious summer salad!! Perfect! Ooh, this is real delight! 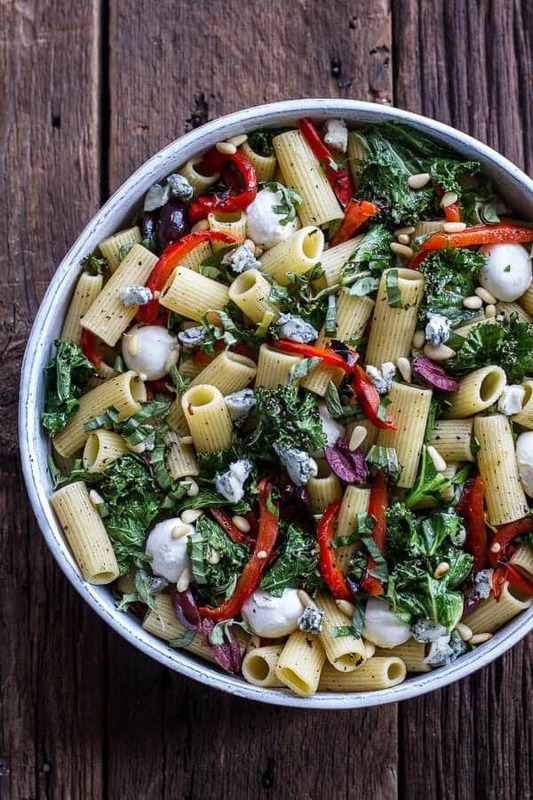 That is one gorgeous pasta salad with all my favorite things. OK Tieghan, this is absolutely delicious!!! I made it tonight with a few changes (used goat and feta cheese instead) and we had it for dinner along with your Moroccan Chicken Skewers and they were both fabulous! Although I just realised that I totally forgot about the minted goat cheese yogurt! Oops! Oh well, everyone seemed to love them anyway! Thank you for such fantastic recipes! P.s. I also have a picture! Where could I share? I have never grilled kale but it will definitely be my cooking method of choice next time I eat it! This is wonderful. We just planted kale so I’m stockpiling recipes because we always end up with more kale than we know what to do with. Thanks so much! Thanks so much! 🙂 Jealous of your kale! Haha! Glad I am not alone! Thanks! 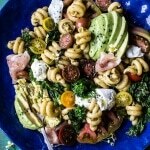 This is my kind of pasta salad! Love all those veggies, greens and bold Greek flavors. Sounds killer, Tieghan. Thank you so much, Kate! I am huge fan of greek flavors! Just wanted to clarify what you meant by pepperchinis. 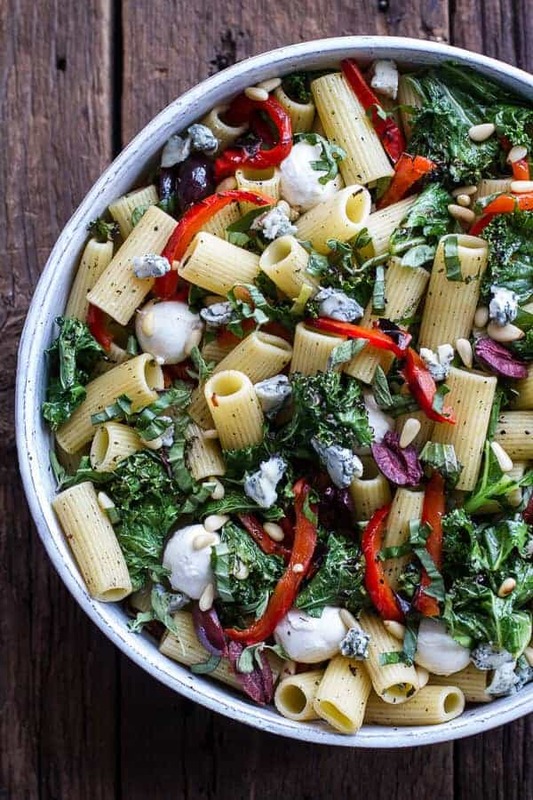 Making this pasta salad next weekend and so excited about it! You can use pickled pepperchinis or fresh, but I used jarred pickled pepperchinis. if you cannot seem to find the, don’t worry about it. Top marks for this recipe. Tastes superb. Thanks for sharing. Thank you! So happy you loved it! Love your dishes, thank you for sharing such fabulous meals. So happy you tried it Joey, and even happier you liked it! Your so welcome!